Matt Pannell: The last time London was gridlocked by a tube strike you had to cross town to play a gig in Soho, with a double bass. Why did you choose such an instrument to begin with? 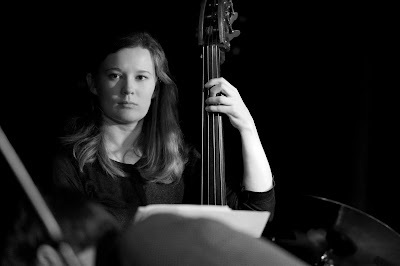 Flo Moore: I actually started with the electric bass, aged nine. My brother played bass in the school jazz band, which was pretty good. He was four years older than me, so I replaced him. We lived in Aylesbury where there’s a music hub with loads of good bands. By 16, I was really into jazz, so I moved onto the upright bass. MP: People sometimes overlook the ‘rhythm section’ or the ‘back line’. It seems less visible and less talked-about. Tell us what marks out a master-bassist. FM: Listen to Jaco Pastorius. He transformed the role of the electric bass from just groove and timekeeping into a frontline instrument, on a par with a saxophone or a guitar. Listen to Weather Report or his own records. Having said that, being part of the ‘back line’ suits me fine as I’m still doing an important job, but as part of the ensemble rather than as a soloist. MP: Jazz music is hard. Why do it? FM: Because playing jazz is so exciting. There’s constant communication between band members, even as a duo. It’s a group effort. Also, everyone you’re playing alongside is there because they love it, not because of the financial reward! MP: What brought you to where you are today? Of all the listening, lessons and playing, what were the highlights? FM: Ray Brown and Paul Chambers are the players I remember hearing and transcribing first. I also had a series of great teachers at the Academy: Jeremy Brown, Tom Herbert, Mike Janisch and Jasper Høiby, and then there were the visiting experts like Dave Holland and Drew Gress. All of them had different approaches. I did so much ensemble playing at the Academy – there was something to learn from every lesson or gig. MP: On 9th May last year, you gave a memorable performance with saxophonist Tom Barford’s band, Asterope. It was an eye-opener, really showing what can be done with the instrument, given the space. How did you find your sound? FM: I’m still trying to refine it now. There are so many possibilities, so many variables – instruments, strings, amplifiers, technique… there are an infinite number of combinations. So, when will I eventually find it? Maybe never! MP: What music do you like playing? FM: I’m quite into electric bass at the moment. I’m also playing double bass in a lot of bands doing originals – it’s a rewarding, intimate thing, playing new music with friends. Also, I really enjoy playing standards. The main thing is to see people getting into the music. MP: It’s not necessary to have a view on this just because you are one, but where are the women in jazz music? FM: It’s something that’s getting better. When I started my course at the Academy there were two girls. When I left there were four, and I know there are more coming through the Junior Jazz course. I think there are more at Trinity and Guildhall, too. I’ve never found it to be a hindrance. If anything it has brought me opportunities – like this one! I’ve never worried about it, and to the girls coming through I’d say that if you have the ability, things will happen for you. MP: Tell us about the market for jazz musicians in London. Where do you see this going? FM: It’s good, I think the scene is thriving and there are plenty of opportunities for good players. But I can’t imagine it ever returning to the mainstream like it was in the 30s and 40s when people like Louis Armstrong and Glen Miller were household names. However, jazz education is growing which helps maintain a young audience and a good supply of new musicians. FM: For now I’m just enjoying live playing and recording. I try not to worry about what’s coming 10 or 20 years down the line. Maybe it’s going to be writing, producing or whatever. It’s going to be harder to make a living just from gigs, because more people are getting better, younger. And I’m saying that at 24! MP: For readers who’ve not yet heard you play: where do they need to go? - I also play in the Phil Meadows Project [LINK] and the Barry Green Sextet.